Although many of us try our best to retain our natural teeth for as long as possible, sometimes decay, damage, or trauma becomes so extensive that your only option is extraction. Alternatively, affected teeth may even fall out on their own accord. If you have or are expecting multiple gaps in your smile, you will undoubtedly have serious concerns about the appearance and functionality of your teeth. At this point, Dr. Ospina may recommend that you consider dental implants, as a viable tooth replacement option, and in particular we may recommend All-On-4 or All-On-6 dental implants. Both All-On-4 and All-On-6 dental implant procedures can help to restore the function and beauty of your teeth. However, there are a few distinct differences between the two treatments that could make one of them more suitable for your personal circumstances than the other. What do All-On-4 and All-On-6 dental implant procedures have in common? The aim of both of these procedures is identical with the goal of being able to replace a full arch of teeth in one treatment. 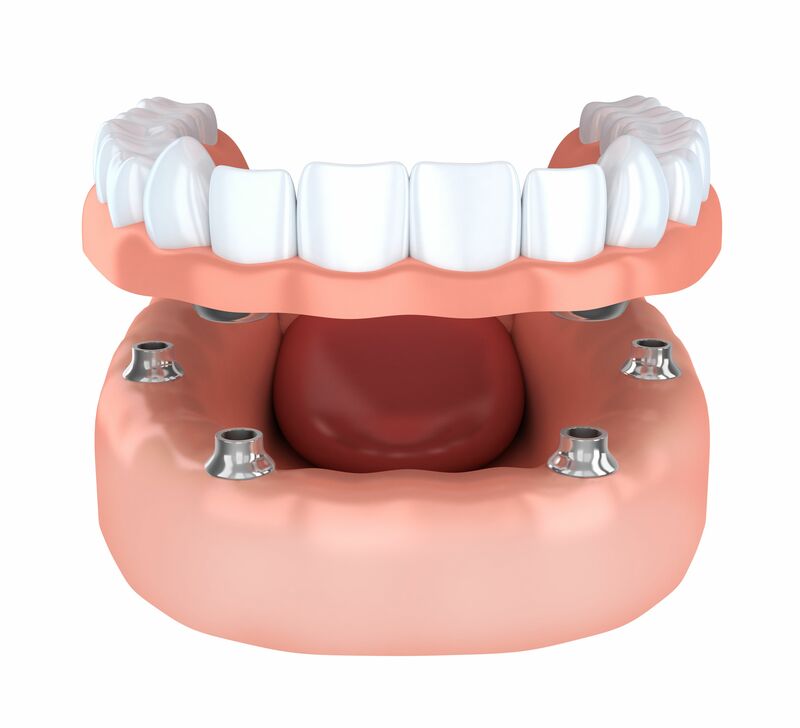 Unlike conventional dentures, which were previously the go-to treatment for missing teeth, dental implants are held in place using secure connectors. This benefit eliminates many of the disadvantages of dentures, such as the need to remove them for eating and cleaning, and the embarrassing slips they can make when you talk, laugh or sneeze. The All-On dental implant procedures involve removing any existing teeth from the arch, and replacing them with a full set of beautifully crafted, color-matched prosthetics, which are placed onto a denture-style mold. This then sits on top of your gums and is held on to the titanium dental implant posts using ultra-secure connectors called abutments. The All-On procedures are normally performed while the patient is under a general anesthetic, meaning that you will be unconscious and feel no pain during the surgery. One of the biggest advantages of dental implants is that they support the jaw bone, reinforcing it and creating a safe and robust foundation for your removable or fixed dentures. This means that they will not slip, slide, or fall out, and you can enjoy your day-to-day life without worrying about them. Another key benefit to choosing the All-On procedure is that the process to receive your new smile is much faster and more convenient. In the past, it could take months to have the procedures necessary to obtain a full arch of teeth, with prolonged periods of healing between each surgery. With the All-On procedures, you can have your temporary denture fitted the same day as your implants meaning that you can start using your new teeth right away. What is the difference between All-On-4 and All-On-6 dental implants? Unlike individual dental implants, which require a single titanium implant post per prosthetic tooth, the All-On procedure places the entire arch of teeth on just a handful of posts. In All-On-4 dental implants, 4 implant posts are used to support the arch. In All-On-6 dental implants, 6 implant posts are used to support the arch. This is the most obvious difference between the two different procedures. However, there are a few more elements that your dental implant surgeon will take into consideration when it comes to making a recommendation as to which is the right procedure for you. Many dental implant surgeons recommend that All-On-6 is the best option for patients who have poor jaw bone density. This is because placing the implants actually stimulates bone growth, which helps strengthen it and give the patient’s jaw a more defined appearance. Some dental implant surgeons also believe that All-On-6 implants provide better stability for the denture, dispersing the pressure of the mouth and bite more evenly which can also help your new smile to look beautiful for longer. If you are missing multiple teeth, and you are ready to restore your smile, or if you are fed up with the inconvenience of wearing dentures, All-On dental implants could be the perfect solution. If you aren’t sure whether All-On-4 or All-On-6 dental implants are right for you, arrange a consultation appointment today with experienced implant dentist in Coral Gables, Dr. Gloria Ospina. Call Gables Perfect Smile today to learn more 305-901-0700.